It was tempting to stay a while longer in Yorkshire but my new found freedom is not so great yet to allow excursions on a whim without regard to the simpler things that must be done at home. Plus, my prayer, which had been answered, had been for four days fair weather - it was fair for November given that there had been no rain during daylight hours. So best not to stretch my fortune. 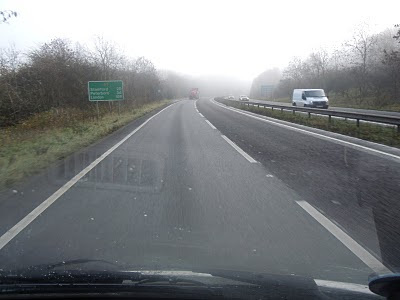 It was a foggy return journey though, the North South Divide on Friday being where the Sun broke through nearer home. Back to daydreaming about long distance walks now with no excuse for lack of time to prepare the body to do them. I think you've been fortunate with the weather. Armchair walking is always great at this time of year as other seasonal pressures change. The lovely A1, my link road south ... a friend to exploring places and my enemy in North Yorkshire at the moment with another year of roadworks.